肖轩, 牛银波, 杨园园, 董栋, 李京宝, 商澎. 铁稳态及黄酮类化合物对其调控的研究进展[J]. 中国药理学通报, 2018, 34(8): 1053-1056. XIAO Xuan, NIU Yin-bo, YANG Yuan-yuan, DONG Dong, LI Jing-bao, SHANG Peng. 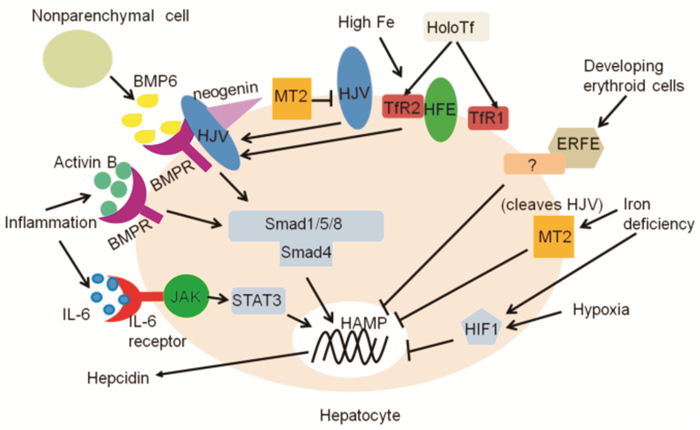 The research progress of iron homeostasis and flavonoids in its regulation[J]. Chinese Pharmacological Bulletin, 2018, 34(8): 1053-1056. Abstract: Iron plays an important role in many essential biochemical processes of the human body, but many studies show that the imbalance of iron homeostasis is closely related to the occurrence of multiple diseases in the body. Based on the pathogenesis of imbalanced iron homeostasis and the structural characteristics of flavonoids chelating iron, this paper summarizes the research progress of iron homeostasis and flavonoids in its regulation, in order to provide a reference for the development of flavonoids as drugs for preventing the imbalance of iron homeostasis. 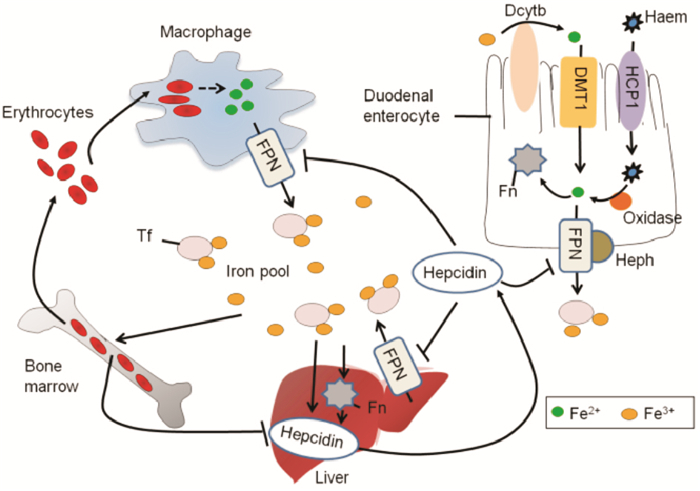 Fig 1 Regulatory mechanisms of iron homeostasis-associated regulation proteins on systemic iron homeostasis Tf:transferrin; Fn:ferritin; Heph:hephaestin; FPN:ferroportin; Dcytb:duodenal cytochrome b; DMT1:divalent metal transporter 1; HCP1:haem carrier protein 1. Fig 2 Regulation of hepcidin expression in hepatocytes IL-6:interleukin-6; JAK:janus kinase; STAT3:signal transducer and activator of transcription 3; BMP6:bone morphogenetic protein 6; BMPR:bone morphogenetic protein receptor; HJV:hemojuvelin; MT2:matriptase 2; TfR:transferrin receptor; HoloTf:holotransferrin; ERFE:erythroferrone; HIF-1:hypoxia-inducible factor 1; HFE:human haemochromatosis protein. Wilkinson N, Pantopoulos K. The IRP/IRE system in vivo: insights from mouse models[J]. Front Pharmacol, 2014, 5: 176. 雷宇华, 范婧琪, 常彦忠. 铁过载引起的疾病:一种"沉默"的疾病[J]. 生物学通报, 2011, 46(9): 11-2. Lei Y H, Fan J Q, Chang Y Z. Diseases caused by iron overload:a "silent" disease[J]. Bull Biol, 2011, 46(9): 11-2. 顾伊丽, 邵宗鸿. 铁负荷过载研究进展及治疗[J]. 中国实用内科杂志, 2010, 30(12): 1141-2. Gu Y L, Shao Z H. Iron overload advances in research and treatment[J]. Chin J Prac Intern Med, 2010, 30(12): 1141-2. Jiao Y, Wilkinson J, Di X, et al. Curcumin, a cancer chemopreventive and chemotherapeutic agent, is a biologically active iron chelator[J]. Blood, 2009, 113(2): 462-9. Chinese Pharmacological Bulletin, 2018, 34(8): 1053-1056.